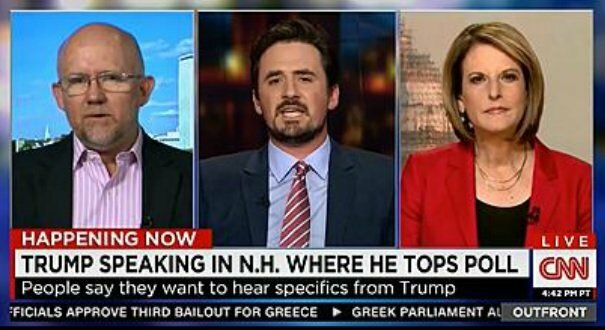 Former George H. W. Bush consultant Rick Wilson lashed out at Breitbart Editor-in-Chief Alex Marlow tonight on CNN accusing Breitbart.com of being the “Pravda” for Donald Trump. Despite Rick Wilson’s insults Alex Marlow probably delivered the sharpest blows. You see the reason why Trump has so much more momentum is actually because of commentary like Rick’s, where we respectfully disagree. But Rick is from this consultant class, from the GOP establishment, and so much of the grassroots are not interested in what they have to say and the direction they’re leading us. Leading us towards Jeb, a guy with no energy, that doesn’t get the grassroots fired up. What gets the grassroots fired up is Trump staying on immigration, being media savvy, calling people out repeatedly–people are loving it. Whether or not you’re happy about that, that’s up to you, but people are loving it. Wilson has strong ties with the Bush family who calls himself a Republican media consultant – which tells you a lot right there. Is there any Republican worth a rat’s a$$ on communications besides Donald Trump and a few others? Wilson tweeted this out earlier today. @gatewaypundit Just so you know, I haven't lived in DC for 20 years.